View of “Geta Brătescu,” 2018. Brătescu, who passed away in September, often worked with found materials, developing not only innovative variations through her serial bodies but also enriching and complicating them until they became a world of her own. This world came to culmination, first and foremost, in her Bucharest studio. The latest work in the exhibition is the half-hour-long video Gestul, desenul (Gesture, Drawing), 2018, made in collaboration with Ștefan Sava and shown here for the first time. Surrounded by paper piles, pens, and books, Brătescu expounds on the value of drawing, nested in the special nook that allowed her to preserve personal and intellectual independence—and the right to take part in cultural production. 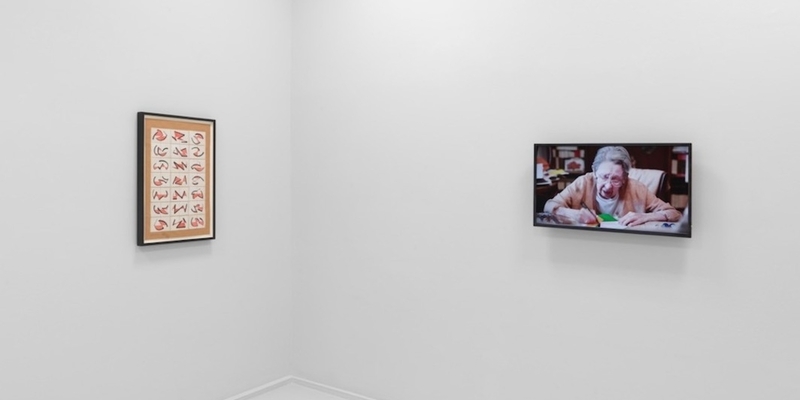 The showroom at the Neuer Berliner Kunstverein, withdrawn and intimate, provides the perfect setting for exploring how Brătescu translated her own experience into intimate, expansive experiences for others.